The college football off-season has seen an immense trove of educated guesses as to how the Oregon Ducks football program will adjust to life without Heisman Trophy winning quarterback Marcus Mariota. Indeed, the future looks bright for the Ducks, not only in the candidates who wish to replace Mariota, but in a wildly talented supporting cast of running backs and all-purpose backs. 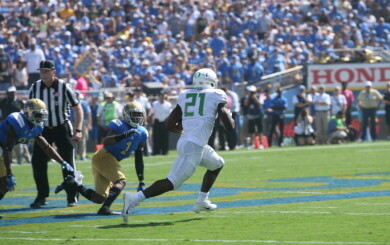 Despite the daily projections, myths, fantasies, and nostalgic reverie, there are three good reasons the Ducks will rely on their running backs for success. Royce Freeman hopes to follow up his remarkable freshman year as one of the primary running backs for the Ducks in 2015. With Mariota off to the NFL, Oregon head coach Mark Helfrich and offensive coordinator Scott Frost will have their work cut out for them to fill that particular void. Surely, Mariota’s replacement will be a dynamic signal caller, but Duck fans should expect a learning curve. The coaches will make adjustments which suggest that the Ducks’ offense may be tailored to fit a talented and heavier backfield. A name that has made national watch lists is true freshman running back Royce Freeman. The Pac-12 Freshman Offensive Player of the Year returns for his sophomore effort with the Ducks, primed for another 1,000-plus yards rushing season and even a potential Heisman Trophy. The tenacious stalwart from Imperial, Calif. had an incredible college debut, amassing 1,365 rushing yards and 18 touchdowns. Thomas Tyner is expecting have an explosive year after being sidelined due to injuries last season. Freeman is joined by junior Thomas Tyner, an explosive playmaker able to burst through the front line, make cuts on a dime, and bully his way into running lanes. While Tyner is an explosive home-run hitter, his playing time was significantly reduced due to injuries last season. Barring any future setbacks, expect Tyner and Freeman to be a potent one-two slug and plug combination. A “jumbo package” isn’t foreign territory for the Ducks. In 2007, Oregon’s running backs corps was a three-tailback gut-punch comprised of Jonathan Stewart, Jeremiah Johnson and Andre Crenshaw. Stewart handled most of the workload, rushing for an eye-popping 1,722 yards and 11 touchdowns, complemented by the wizardry of quarterback Dennis Dixon and first year offensive coordinator Chip Kelly. The following season, Kelly demonstrated that Stewart’s success as a bigger runner wasn’t an isolated incident and developed a two-prong attack with LaGarrette Blount and Jeremiah Johnson. Blount and Johnson shared carries, surpassing 1,000 yards rushing each and a combined 30 rushing touchdowns. What’s one to make of all this? 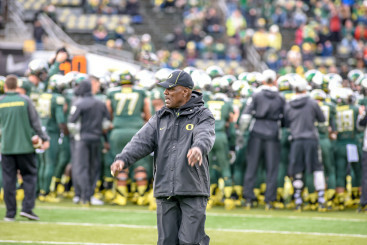 The circumstances are ripe for the Ducks to return to a more ground-based attack. 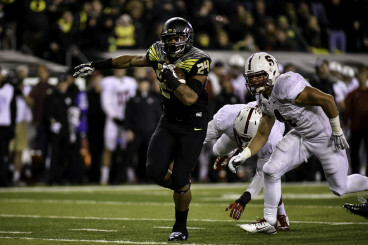 In 2015, Oregon will have the experience, ability, and expertise to go big in the backfield. While the power run game is surely on the table, longtime running backs coach Gary Campbell has a penchant for the small and speedy. The remarkable careers of LaMichael James, Kenjon Barner, and De’Anthony Thomas are the most recent examples of Campbell’s ability to develop running backs regardless of size. 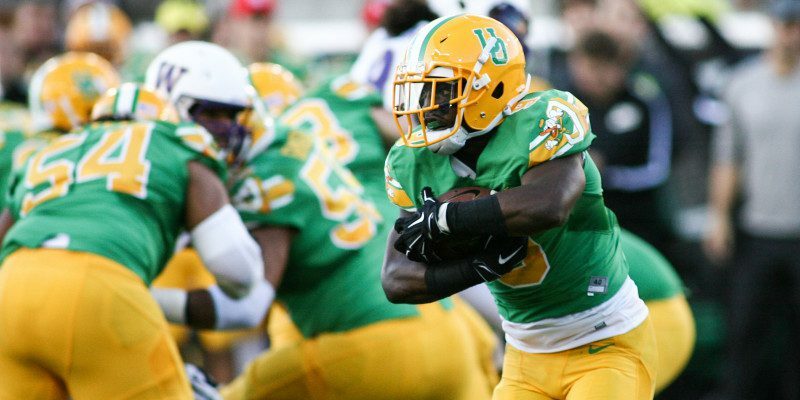 They are also a testament to Oregon’s commitment to speed and offensive versatility. Whether it’s sprinting to beat defenders to the edge, blocking downfield, or lining up in the slot to turn short catches into long gains, the prototypical Oregon running back is a multi-talented athlete with a high football IQ and an ability to fulfill a variety of tasks. And again, in this group, size really isn’t factor. Byron Marshall has embraced his role as an all-purpose back, becoming a reliable and flexible weapon for the Ducks. The 2015 season will usher in a whole host of new talent. One who fits the “LaMichael James” mold is redshirt sophomore Tony James (no relation). The Gainesville, Fla. product spent last season on the Ducks’ scout team and has made a strong impression on coaches, drawing comparisons to Oregon’s two-time All-American running back and Doak Walker Award winner, LaMichael James. The 5’9″ 180 lb. all-purpose back will compete for playing time with senior Byron Marshall and 247Sports.com top rated all-purpose backs, Taj Griffin and Kirk Merritt. Running back coach Gary Campbell has developed all-star backs of all sizes. Last year, Marshall carved a niche for himself as the primary flex-back and slot receiver and is the incumbent for the starting job. The veteran back rushed for 392 yards (averaging 7.5 yards per carry) and had 1,003 receiving yards and six touchdowns. But with a strong recruiting class, some redshirts could potentially get burned, opening up a new world of possibilities for Oregon with a multitude of capable flex-position players. Marshall definitely has a leg up on the newcomers, but remember: No job is safe in Eugene. In the post-Mariota era, Oregon will be looking for new leadership to inspire, motivate, and guide the Ducks football team to another national title appearance. While the quarterback traditionally inherits leadership responsibilities, this is not always the case. A large number of the ”Men of Oregon” are skill position players and return this season with high hopes. It’s only natural that an appetite for greatness grows stronger after participating in one of the greatest seasons in Oregon football history. Mariota was born to lead and did so by example. The soft-spoken Hawaiian was fiercely competitive and demonstrated true sportsmanship and a brand of football that was contagious for his teammates — and this running back corps may be the most talented returning skill position group Oregon football has ever seen. Marshall, Freeman, and Tyner all have the opportunity to take the reins, aspiring for individual and collective greatness. It’s quite possible the new team “leader” will be the entire group of running backs, as the depth, experience, and knowledge is present in every one of them. 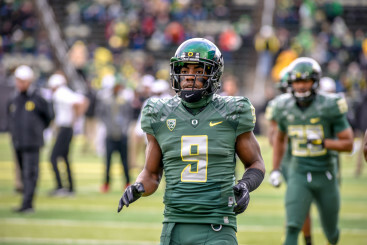 Mariota left a lot behind and it is very likely it’s still in the Oregon backfield.